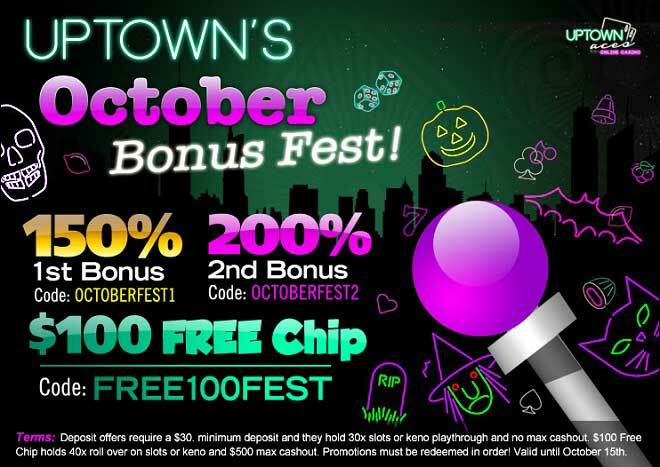 Uptown’s October Bonus Fest + $100 FREE! Fall is the season of pumpkin flavored wins and spooky good times Uptown! And what better way that to welcome the change of the leaves and October with a couple of huge bonuses and a $100 Free Chip? Spend the first 15 days of the month thinking about pumpkin patches, coming up with your Halloween costume and also winning right from the get go when you deposit as little as $30! You’ll be the first to claim a 150% October Bonus, continue over to a 200% Match and top off your beginning of autumn with a $100 Free Chip! Scarecrows won’t be part of your start of October as much as wins and thrills Uptown!